One reason I have always questioned the claim that the government only collects a fraction of US call records is because of past Administration claims about the intent of the program. Nakashima even notes this: back in July James Cole said you have to have the entire haystack to find a needle. Cole is not the only who has made the claim in official settings. Even given James Clapper’s history of lying to Congress, I still take comments to Congress with greater weight than anonymous, obviously seeded leaks to reporters at convenient times (to Nakashima’s credit, she gets NSA Deputy Director Rick Ledgett on the record, though tellingly, in his comment, he refuses to say anything about the scope of the program). The Intelligence Community was implying the collection is comprehensive even before Snowden’s leaks. In 2011, the government told Congress it collected “substantially all” of the records from the providers included in Section 215 orders. Claire Eagan repeated that claim in her July 2013 opinion on the dragnet. And while Eagan doesn’t endorse that claim in her own voice, she raises the “substantially all” language again in her legislative reenactment discussion. She may not be saying NSA collects substantially all phone data, but she is arguing (incorrectly) that Congress authorized it to do so. While that certainly leaves the possibility of treating Verizon land line service separately from Verizon wireless (it’s not clear the Congressional notice ever got that much detail on which providers were included, and there are reasons the Administration may have wanted to claim it got everything from the providers even if it only got land line traffic), the notice to Congress in 2011, repeated last year, supports a claim of much broader collection. This blunt tool only works because it collects everything. Richard Leon (who presided over a suit naming Verizon Wireless) captures the conflict within the government’s message better. The Government obviously wants me to infer that the NSA may not have collected records from Verizon Wireless (or perhaps any other non-VBNS entity, such as AT&T and Sprint). Curiously, the Government makes this argument at the same time it is describing in its pleadings a bulk metadata collection program that can function only because it “creates an historical respository that permits restrospective analysis of terrorist-related communications across multiple telecommunications networks. and that can be immediately accessed as new terrorist-associated telephone identifiers come to light.” Govt.’s Opp’n at 12 (emphasis added); see also id. at 65 (removing plaintiff’s phone numbers “could undermine the results of any authorized query of a phone number that based on RAS is associated with one of the identified foreign terrorist organizations by eliminating, or cutting off potential call chains”). Put simply, the Government wants it both ways. Virtually all of the Government’s briefs and arguments to this Court explain how the Government has acted in good faith to create a comprehensive metadata database that serves as a potentially valuable tool in combating terrorism–in which case, the NSA must have collected metadata from Verizon Wireless, the single largest wireless carrier in the United States, as well as AT&T and Spring, the second and third-largest carriers. [snip] Yet in one footnote, the Government asks me to find that plaintiffs lack standing based on the theoretical possibility that the NSA has collected a universe of metadata so incomplete that the program could not possibly serve its putative function. Candor of this type defies common sense and does not exactly inspire confidence! With Leon’s take in mind, consider what we know about the NSA’s dragnet. First, the dragnet that NSA now claims doesn’t include cell data seems to keep finding cell phones, even as far back as 2007 when it identified Basaaly Moalin’s cell phone off what was almost certainly a cell phone used by Aden Ayro (the NSA would later ask the FBI’s help to find Ayro’s new phone, suggesting he was using burner cells, and Somali warlords certainly don’t operate in an environment with well-developed land line infrastructure). The Najibullah Zazi phone NSA contact chained was a cell phone, and my understanding is the Adis Medunjanin phone the dragnet found was also a cell. The NSA boasted of using the dragnet for peace of mind after the Tsarnaev brothers — at least Dzhokhar of which used his cell phone constantly, even during their attack — attacked the Boston Marathon. 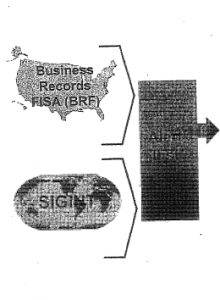 The main examples the NSA offers as phone dragnet successes involve cell phone targets. That doesn’t mean land lines weren’t involved — the second hop connecting Aden Ayro and Basaaly Moalin (whom I’ve always suspected was his hawala) — could have been a land line. The second hop between the Zazi cell and what I believe was a Medunjanin cell might be a land line. But the targets here all used cells. There’s no reason you’d design a dragnet targeting likely immigrants (as all these men were) without including the cell phones that reflect their potentially more transient lifestyles (each plot featured men who had worked as cabbies or drivers at some point). We also know the Section 215 data is just one part of redundant database that also includes EO 12333 data (and probably data from GCHQ). By 2009, NSA identified and tracked 3,000 suspect US phone identifiers using non-Section 215 means (and NSA simply kept them in its EO 12333 dragnet after it discovered they hadn’t received First Amendment review). NSA trains analysts to use the redundancy of the system, to create EO 12333 results, if possible, even if originally finding queries via Section 215 data, because the former have more permissive dissemination rules. This detail, available only at the “second hop” and only visible due to the blending of BR FISA and SIGINT data, quickly identified the Medunjanin number as a priority lead for the FBI. Collection against foreign terrorists and telephony metadata analysis were utilized in tandem with FBI law enforcement authorities to establish Headley’s foreign ties and them in context with his U.S. based planning efforts. … The NSA used both Section 215 and EO 12333 data in its queries (indeed, PCLOB confirms what I noted here — that the useful contact chaining on Headley was conducted under other authorities). Further investigation, also not involving Section 215, provided insight into the activities of his overseas associates. In addition, Section 215 records were queried by the NSA, which passed on telephone numbers to the FBI as leads. Those numbers, however, only corroborated data about telephone calls that the FBI obtained independently through other authorities. With the recognition that the NSA uses Section 215 in conjunction with EO 12333 data (probably including Internet data), check out how NSA SID Director Theresa Shea alternates between talking about the Section 215 phone data and telephony metadata more generally, and discusses how Section 215 complements other authorities. 50. Furthermore, the Section 215 metadata program complements information that the NSA collects via other means and is valuable to NSA, in support of the FBI, for the linking of possible terrorist-related telephone communications that occur between communicants based solely inside the U.S.
51. As a complementary tool to other intelligence authorities, the NSA’s access to telephony metadata improves the likelihood of the Government being able to detect terrorist cell contacts within the U.S. With the metadata collected under Section 215 pursuant to FISC orders, the NSA has the information necessary to perform the call chaining that enables NSA intelligence analysts to obtain a much fuller understanding of the target and, as a result, allows the NSA to provide FBI with a more complete picture of possible terrorist-related activity occurring inside the U.S. When the NSA talks about a “telehphony metadata” database, they’re referring to an interface that draws on data from EO12333 and Section 215, at a minimum. It’s the larger dragnet — not just the Section 215 subsection of it — that needs to be and probably is comprehensive. What the NSA is anonymously leaking to journalists is that Section 215 only gets a fraction of the US phone data. What the NSA is not saying (and what their more formal declarations have made clear they’re not saying) is that NSA only has access to 30% of US phone data. All that said, I think NSA may be leaking what I suspect is deceptive information because of problems they’ve created for themselves with the dragnet, as I’ll show in my follow-up post. Update: Note that the LAT version (h/t PJ Evans) of this story notes PCLOB Chair David Medine has asserted that the phone dragnet collects everything. Medine did not respond to a request for comment Friday. While in context of his testimony, Medine’s assertion seems to refer exclusively to Section 215 phone records, it is worth noting that PCLOB — which as I showed above considered closely how 215 interacts with 12333 data — made this assertion. Update: This WSJ article from June (which some of these stories cite without thinking through what it means) makes it clear that, while NSA doesn’t get T-Mobile and Verizon’s cell data from them (suggesting it does get AT&T and Sprint’s cell data), it does get that data from other sources. Well, one thing for sure: if the story being suggested is true and NSA is collecting only 30% and that excludes cell phone data, that’s far worse than the previous [secret nudge nudge] paradigm that they are collecting it all. Right? If they’ve needed $52 Billion a year since 2001 and this is all they’ve come up with, what the hell does that portend? (1) That they’re unbelievably incompetent both for targeting land lines first in the War on Terra, not to mention for focusing on land lines first in the 21st Century; (2) are we next going to be told by DiFi and Clapper we need to triple their budget to meet the “new threat posed by cell phones”? I mean, for $52 Billion a year, at least we could feel all manly that our NSA was indeed getting the “whole haystack” they’ve been referring to for justifying their burial of the Fourth Amendment, right? Frankly, for the press breathlessly to report this newest spin as anything other than a lie, a joke or else a confirmation of duplicity and incompetence at astonishing levels is really too much. The suggestion is somewhere near the French guard’s “I told them we already got one” out of Monty Python and the Holy Grail for comedic effect. Thanks for mentioning that it’s more likely than not that any suggestion that what gets collected under 215 comprises the full extent of what gets collected doesn’t really make much sense, Marcy. So let me see, 7 billion people, less 200 million Americans (the 2/3rds not being tapped) means there are only 6.8 billion people being spied on by the NSA. I read this comment here: http://www.emptywheel.net/2014/02/06/emptywheel-and-first-look-media-beginnings-and-continuity/#comment-668016 and thought, yeah, me too, as an Aussie, I sure would like to see a bit more of a world view. A headline saying “NSA CLAIMS TO SPY ON ONLY 6.8 BILLION WORLD CITIZENS” might just catch more attention than one saying “only 1/3 of US calls are tapped”. should be “…have the entire…” no? Also, just a question, is the EmptyWheel server being DDoS’d? It just is not performing and has not been up to usual pace since the First Look announcement. The National Security Agency collects phone data from less than a third of U.S. calls, officials say, which may undermine the assertion that the program is essential for fighting terrorism. This is certainly a misinformation campaign. They are taking advantage of the fact that the vast, vast, vast majority of people (say 99.9%) have no idea how the telephone system actually works. I have previously commented that every last cell phone call made enters in and passes through the same telephone system that land lines do. While the NSA would want people to think that somehow cell phone call are handled by a completely different network it simply isn’t true. All of the towers must (eventually) enter into the existing system. They didn’t build any additional infrastructure beyond the cell phone towers and some microwave relays to support cell phone usage. T-Mobile and all of the rest of the cell phone providers use the existing infrastructure that is owned by ATT, Verizon, Sprint, and whoever owns what MCI/Worldcom had built out. The majority of phone calls made in this country have at least one participant that is not using a cell phone. So even if the articles were not misinformation at least one end of the call would generate call detail records. But the articles are misinformation because ATT and all of the other companies didn’t go out and roll up an entire new billing system just to handle cell phones using different kinds of records and so forth. They rely on the call detail records for billing which is all part of Signaling System 7 which has a parallel International Telephone Union (ITU) standard that has been the status quo for over 30 years. As I also pointed out during the DISHFIRE post you had that even text messages are sent over the existing telephone system. It is the reason why text messages are limited to 160 characters and that has never changed since the beginning of text messaging – support for such things were written into the standards back in the 1980s. If they weren’t using the existing system we would have the ability to send longer messages by now. Finally, remember that in the White House Whitepaper they said that cell phone location information was not collected under “this” program when referring to Verizon collection via FISA. So we know they do so under another. So this is all part of the government trying to contort everything in the context of the only thing they have acknowledged not the things they haven’t. We have to keep in mind that the government is going to use misinformation and disinformation to take advantage of the simple fact that well over 99% of the population has no idea how the phone system, let alone the Internet, actually works. We will see much more of this from the government and it will cause quite a bit of confusion and work against being able to rein any of this in unless we get some leaks that destroy these misinformation and disinformation attempts. More FISA documents would help. More memos would help. DOJ letters of directives to any of the companies participating would help. @Mindrayge: Yes, your comments have been instrumental in making me understand what the underlying story is here. I really appreciate that. @emptywheel: Crowdsourcing at its best? This seems an expression of the PR gambit of admitting the obvious, but seriously understating the gravity. Target’s PR team used it, for example, in “admitting” to a massive data loss, whose numbers climbed precipitously only after the initial disclosure was no longer headline news. In this case, we should all be worried over the admitted 30%, let alone the no doubt higher percentage the NSA is actually “retaining”. The latter is news, too, because it concerns the government copying, storing, “analyzing”, and releasing processed and unprocessed data – with what restrictions? – to a plethora of other agencies and private sector contractors. @Mindrayge: If the government (or private corporation) can abuse a power, it will.